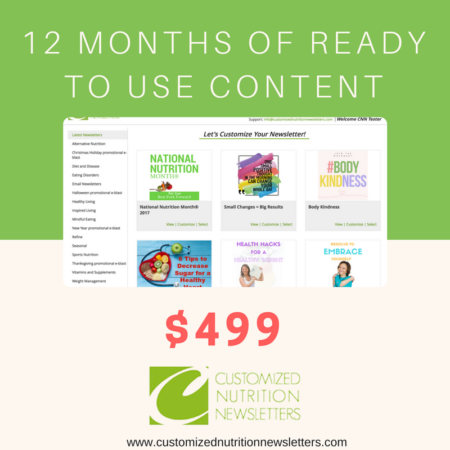 Lock in 12 months of newsletter and blog content and save $89. Billed annually this plan guarantees you will have fresh newsletter and blog content every month. We have hundreds of nutrition and health related articles ready to be used in your Customized Nutrition Newsletters template. Nutrition Newsletter – Related to the latest nutrition news, research, and consumer trends. We cover topics for weight loss, heart health, diabetes, sports nutrition and more. Inspired Living – Taking a non-diet approach to health and wellness, our Inspired Living newsletter provides fresh content related to overall health and well – being. We cover topics including: mindfulness, sleep, goal setting, non – diet approach, eating disorders and more.